For me, watching businesses come and go is an endless source of fascination. Fascination, and, sometimes, frustration. When a new business announces its intention to move into Redwood City, I get excited. That excitement wanes, however, as time passes without the new business opening up. Usually the business eventually opens, but, occasionally, it fails to. In some cases, the fitting out of a storefront for a new business goes in fits and starts, at times moving swiftly and at other times appearing to be completely stalled. All of this is to introduce this week’s topic, which is a set of businesses that finally, at long last, really do appear to be coming to Redwood City. First up is one I’ve been watching seemingly forever, the ice cream shop slated for the tiny retail space at 2621 Broadway, in front of the offices of the tech company Avast and across Broadway from City Pub. Back in July 2016 this space had its windows papered over, indicating that something may have been going on inside. By September 2017 I had received reliable information that it was being fitted out as an ice cream shop. I assumed that turning a brand new space into an ice cream shop wouldn’t take long, but I was quite wrong. For the past 19 months work has been going on inside the space, in fits and starts. 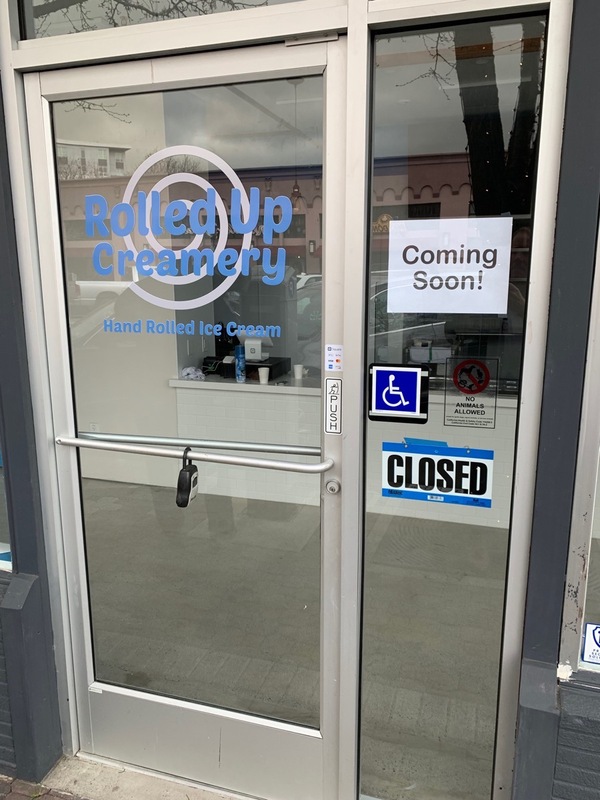 Finally, though, it appears that we are on the cusp of actually being able to buy ice cream at the newly christened Rolled Up Creamery. Once I knew the name I did a bit of internet research and learned that a business with that name had been operating in San Francisco, but according to Yelp that location has closed. According to the sign on our location’s door, however, ours is about to open. “Hand rolled ice cream” (I presume that they flatten it out on a cold surface, sprinkle toppings over it, and then roll it up and put it in a suitable container) seems as if it will be a good addition to this section of Broadway, given the many other food service establishments nearby, none of which serve anything like this. Its proximity to Sequoia High School should also give them a natural supply of afternoon customers. In any case, for all the delays the fact that they are opening just as we are coming out of a long, wet winter season seems well-timed. Further down Broadway another business that had clearly announced its intention to come to Redwood City — and then appeared to stall — is CoffeeBar. Ours is to be the latest installation of a small chain of coffee and tea shops that originated up in Truckee, California. 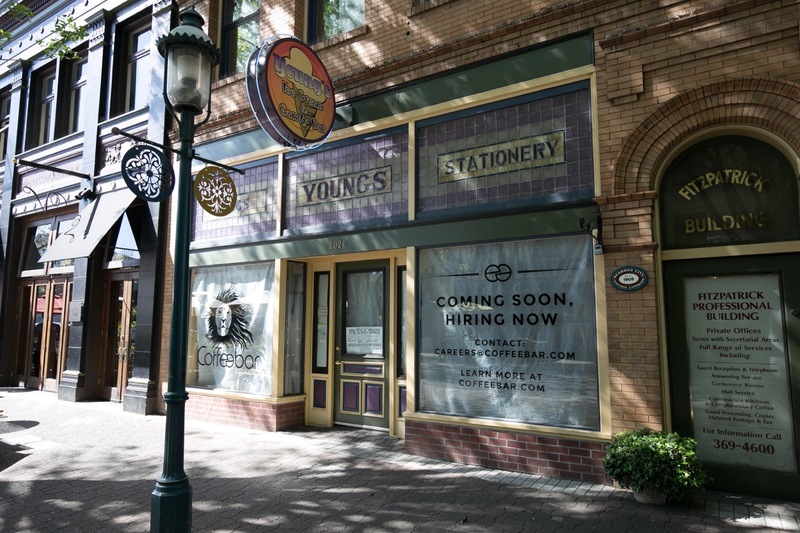 Many months ago CoffeeBar put large signs up in the windows of the old Young’s Ice Cream and Candy Bar storefront, and as long ago as August posted signs indicated that they were hiring for this Redwood City location. But except for those signs, there has been little visible activity at this, their future Redwood City location. Of course, those signs completely block the windows, so I’ve been unable to see into the interior of the space and thus determine whether it was being transformed. However, I will note that I walk by that space quite frequently, and have never seen the front door open — something that I often see at other storefronts that are being remodeled. But I only this week a new sign went up, one that may explain the delay: there is now a liquor license in the window, indicating that CoffeeBar will be serving beer, wine, and some sort of food. I’ve spent some time on the CoffeeBar website, and I can find no evidence that they serve alcohol in any of their other six locations. I’m guessing that they originally intended to replicate their successful formula here in Redwood City, but then took a closer look at Broadway’s nighttime scene. In particular, they may have looked at what The Nighthawk (located just across the street) is doing: they are a cafe by day and a bar by night, serving coffee and a limited supply of food items in the morning and early afternoon, and then serving cocktails and small bites in the evening. Although it appears that CoffeeBar will limit their alcohol service to beer and wine, this formula makes sense as a way to better utilize their space throughout the day and into the evening. In any case, I’m much more confident now that CoffeeBar actually will open on Broadway, although I still have no idea just when that’ll be. Around the corner and down the block from CoffeeBar, at the corner of Marshall and Main streets, there is a large retail space within the Marston building. Last July I heard that it had been leased and was to become the latest link in the Coupa Cafe chain. Coupa Cafe has a number of stores in both Palo Alto and on the Stanford campus, along with one in Los Altos. Ever since hearing that they were coming I’ve been watching the empty storefront, but there has been no visible activity through the large, mostly unobstructed windows. Until very recently, that is. Several days ago the windows were completely covered with signs that have the Coupa Cafe logo, their URL, and the words “Coming Soon.” I don’t know how long it’ll take to outfit the never-occupied retail space, but I’m optimistically thinking that it may not take too long. The name “Carnamic” caused me to wonder if this might be some automobile-related tech startup, but I’m not sure that that is the case. It took some digging, and I still can’t state definitively what they’ll be selling here, but there are some clues to indicate that this is not some fly-by-night operation, at least. 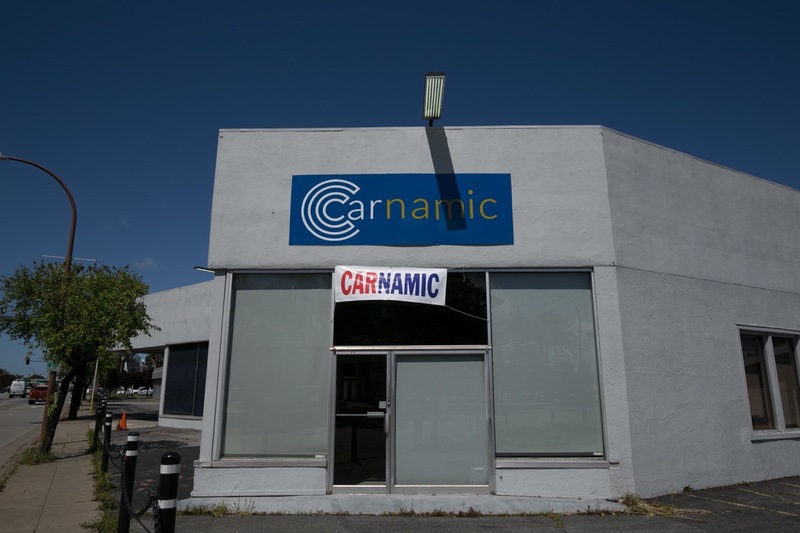 Apparently, Carnamic is the latest in a string of automobile dealerships owned by the Moussa Auto Group out of Hayward, California. The Moussa Auto Group currently operates Hayward Mitsubishi, Daly City Mitsubishi, San Leandro Hyundai, San Leandro Kia, and soon, Carnamic Redwood City. Given their existing dealerships, my first thought was that this would be another Mitsubishi, Hyundai, or Kia dealership. However, the fact that the name “Carnamic Redwood City” doesn’t follow the pattern of the other dealerships leads me to believe that this may in fact be something a bit different. My guess is that it’ll be a dealership devoted to used cars. Certainly, they have signs on both the main building and the small building on the corner, the latter being historically used as the office for the used car portion of the dealership while the main building was used to sell and service new vehicles. 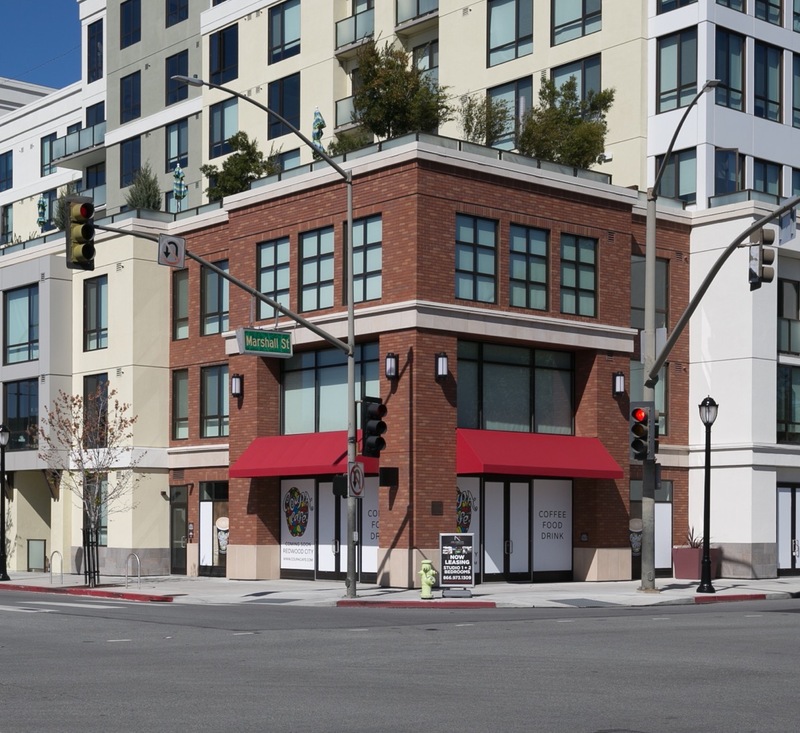 Thus, unlike Land Rover Redwood City, it appears that Carnamic will be using both dealership buildings. One last item. 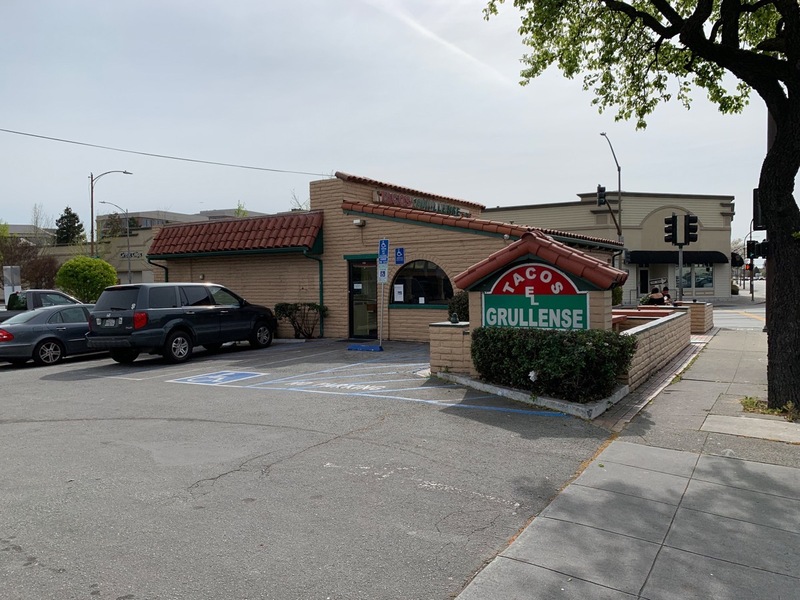 Although it isn’t a new business, and although I have yet to learn whether they managed to obtain the requested permission, the owners of the building on El Camino Real across from Sequoia High School, currently home to Tacos El Grullense E&E, have asked the city for permission to add just under 1,000 square feet to their building. The addition would be tacked on to the side of the building shown above, and would result in the loss of a number of parking spaces. But it would presumably give the restaurant a much larger indoor dining space, something that the building badly needs today. Whether or not this restaurant would remain a member of the El Grullense family — I hope so — or would become something else, I’m not sure: it doesn’t appear that the Ell Grullense chain owns the building. But it does appear that regardless of who occupies the newly expanded building, it will remain a restaurant. I’m pleased to see so much new (and expanded?) business coming to Redwood City: it shows a continuing confidence in Redwood City’s economic environment from a variety of individuals. And we all benefit, both by gaining new places at which to do business, and by no longer having to walk (or drive) past the currently empty establishments. Any news on old Pamplemousse building?? The coffeebar owner mentioned his intention to serve alcohol in this article last August. Thanks for the updates! Looking forward to having a nice ice cream shop downtown, and a solid lunch option with Coupa Cafe. Me too – I’m really intrigued by them. Greg, rather than “flattening ice cream,” I believe “Rolled Up” will be pouring ice cream “batter” onto freezing-cold metal “pans”, then rolling up and serving the resulting ice cream “pancake” along with toppings using a scraping spatula. Thanks for the updates! CoffeeBar in Menlo Park does have a wine bar which is open evenings. I think they even have their own label…not sure on that part though. I was just there this morning, if it’s anything like the MP location it will be a nice addition. Ah, that’s good to know. I didn’t see it on their website but maybe I just missed that, or maybe they don’t advertise it on their website. In any case, I’m looking forward to seeing them in Redwood City!